I’ve got a fantastic treat for fans of Bram Stoker’s Dracula – a stunning Dracula Family Signet Ring! Now, I don’t usually cover news like this, but the ring is so beautiful I couldn’t pass it up. The moment I saw it I had a very Gollum-like moment whispering “my precious” to my computer screen. The replica ring was created by W Hamond and it will launch in conjunction with the Bram Stoker International Film Festival in Whitby, England which is taking place between 28th and 31st of October. 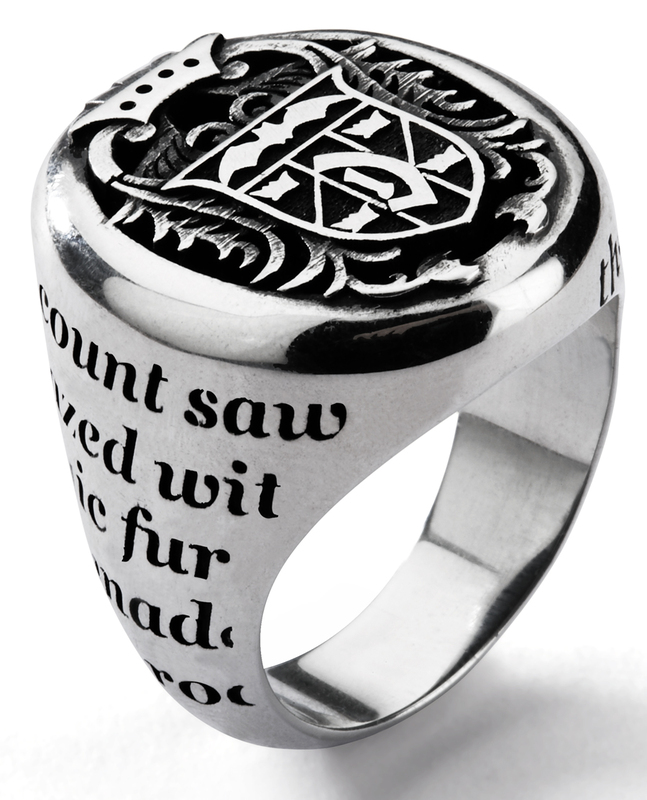 This replica ring is hand crafted from sterling silver and Whitby Jet, featuring the Dracula family crest and also an inscription of words from the original Bram Stoker novel. I want! What about you guys? What do you think of the ring? One of the great things about this ring (other than how beautiful it is) is that it’s launching during the wonderful Bram Stoker International Film Festival, which is premiering a few fangtastic vampire films this year! Yay! If I were to go to this vampire ball (I wish I could!) I would most definitely want that Dracula ring on my finger. Anyone here going to the Bram Stoker Film Festival this year? That ring really is nice. I would like to have it, too. Not going to the Bram Stoker festival in England. I wish. I wish I could go to this ball and Anne Rice’s Lestat vampire ball. But, of course I am creating my own characters, but when I am done, yes, I would love to attend one of these events!